So, one of the most frequent questions I get asked as a tour guide is “what’s going on with Turkey’s tulips? Tulips are everywhere!”. It’s true, tulips have a very special place in Turkey, and given that the official tulip season is just around the corner (April), I thought it was a good time to talk about the tulip. 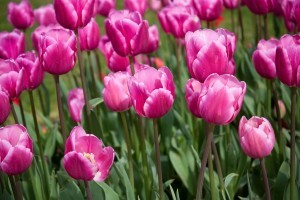 Firstly, most people tulips originated in Holland, but in fact they are native to the Central Asian plains. Although the Ottomans were the first people to cultivate them for commercial purposes, there is evidence of their popularity long before this. The earliest surviving Persian rug, the Pazyryk carpet, dates back to the 5th century BCE and has a number of tulips in its design. 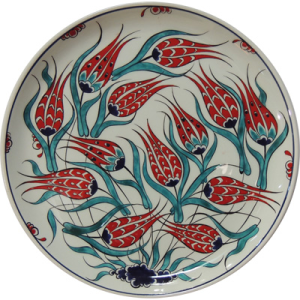 Tulip designs have also been found on tiles and fabrics from the Seljuk Turks. It is believed that tulips first made their way to Europe after an Ambassador from Vienna was given some tulip bulbs and seeds as a gift by Suleyman the Magnificent after admiring tulips in the palace garden. Tulips became so sought after in Holland, that a phenomenon known as “tulipmania” began. I kid you not, tulipmania was a real thing. During this period, as heavy demand depleted tulip stocks, one single tulip bulb could fetch the equivalent of a master craftsman’s salary for 10 years! Although the Dutch government tried to stop this trade, they were not successful. Eventually the market went bust and many people went bankrupt. The Ottomans considered tulips to be divine, and a flower of God. Not only because they are so beautiful, but also because when the Turkish word for tulip, ‘lale’ is written in Arabic script, it looks very similar to the word Allah (God). For the upper classes of Ottoman Society, tulip cultivation was a prized practice. It is often touted as one of the early examples of modern consumerism, as tulips were a sign of nobility and privilege. They were a way to show off both wealth and leisure time. Around the same time as tulips were all the craze, Turkey started to orient itself towards Europe and focused more on the arts and commerce. So it is no surprise that tulips were a staple feature in the artwork of this period. They were embroidered or embossed into textiles, woven into carpets, painted on tiles and other ceramic products, and painted as miniatures. Turkish history also has a period known as the “Tulip Period”. This period began on 21 July 1718, the date when the Treaty of Passarowitz ending the Ottoman-Venetian war was signed, and finished on 28 September 1730 when the Patrona Halil Revolt occurred. The Patrona Hill Revolt in 1730 was a mob uprising in 1730 which resulted in Ottoman Sultan Ahmed III being replaced with Mahmud I. Every year in April, Istanbul hosts the International Tulip (Lale) Festival in honour of tulips and the start of Spring. If you are lucky enough to visit Turkey in April, the moment you leave Ataturk airport you will see them – garden beds full of tulips, providing brilliant splashes of colour in the middle of roundabouts, by the side of motorways, in parks, and in the ground of Istanbul’s palace. Essentially wherever there’s some spare grass, there will be tulips. Last year, the Istanbul municipality planted 14, 420, 000 tulips of nearly 200 different varieties. Yep, that’s not a typo – more than 14 million tulips were planted in Istanbul alone. The tulip festival also boasts lots of concerts and exhibitions, photography competitions, ebru exhibitions, calligraphy demonstrations, and there is also usually a football match as well. Today, tulips can be s potted everywhere. The official tourism logo of Turkey includes a tulip. A tulip can be found on the fuselage of Turkish Airlines’ planes. They continue to be featured in art and ceramic designs, and are also woven into carpets.